Cortana is one of the most notable and most useful features of Windows 10. It allows you to search the internet and your local files and folders. But Cortana’s real usefulness comes to the fore with voice commands. You can talk to Cortana and give it orders by your voice, and it will do ‘everything’ you requested. 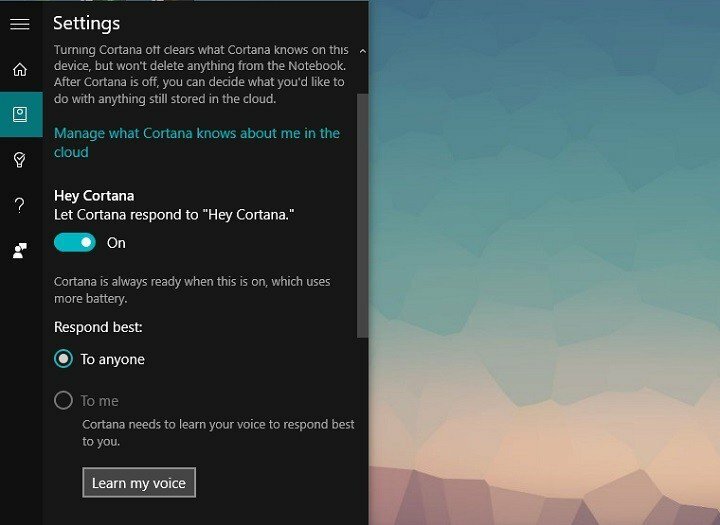 One of the most powerful voice commands for Cortana is ‘Hey Cortana,’ which allows you to ‘draw Cortana‘s attention’ just by saying Hey Cortana, so you don’t have to tap any key to be able to give Cortana a desired command. But some people have complained all over the internet that they’re unable to activate Cortana with this command, or they’re even unable to turn it on. 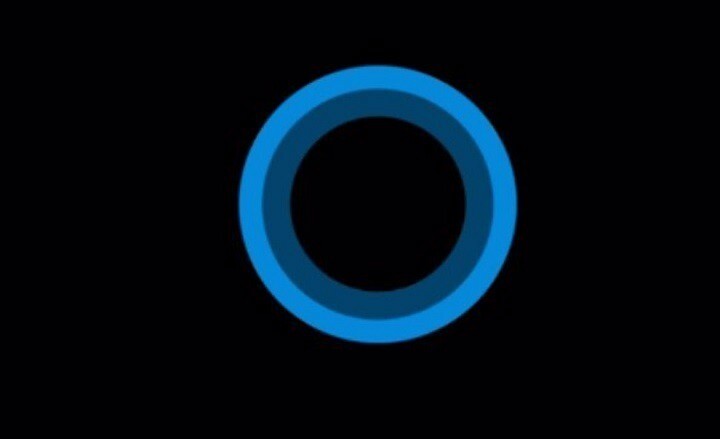 Cortana not working after update – According to users, this problem can appear after an update. To fix the issue, roll back the update or wait until Microsoft fixes the problem with a new patch. Hey Cortana not turning on – If this feature won’t work maybe you need to optimize Cortana to recognize your voice. This is quite simple to do, and you can do it right from the Settings app. Cortana search not working – This can be a big problem, but we already showed you how to fix Windows Search in one of our previous articles, so be sure to check it for more information. Cortana not listening – Sometimes Cortana isn’t listening at all. If this happens, be sure to check your Cortana settings and set the Cortana to respond to everyone. Start Menu and Cortana not working – This can be a big problem, but in most cases, you can fix the issue simply by installing the latest updates. Hey Cortana not turning on, available – Sometimes Hey Cortana might not be available at all. To fix the problem, start your PC in Safe Mode and check if that helps. Open Notebook, and go to Settings. If Hey Cortana option is enabled, you’re good to go. When Settings app opens, go to Cortana. Make sure that Hey Cortana feature is enabled. Now click Learn how I say “Hey Cortana”. Cortana will now open. Click the Start button and follow the instructions on the screen. 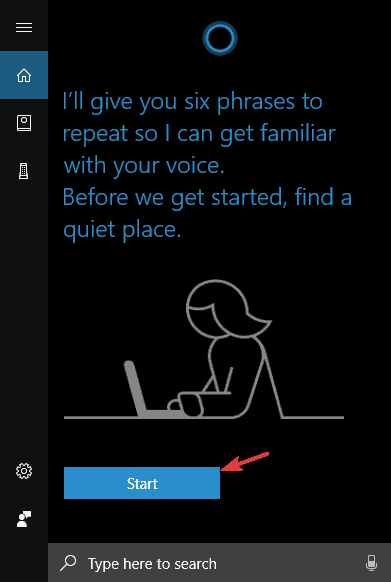 After completing the wizard, Cortana should be optimized to recognize your voice and it will start working again. Open the Settings app > Cortana. 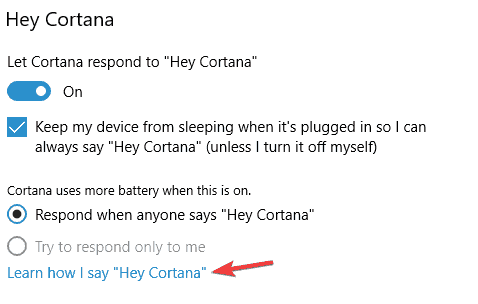 In Hey Cortana section make sure that Respond when anyone says “Hey Cortana” is selected. Few users reported that Hey Cortana feature didn’t work properly if Cortana was set to respond only to their voice, but after making this change, the problem was resolved completely. According to users, this problem can be caused by a temporary glitch, and the simplest way to deal with it is to restart your PC. 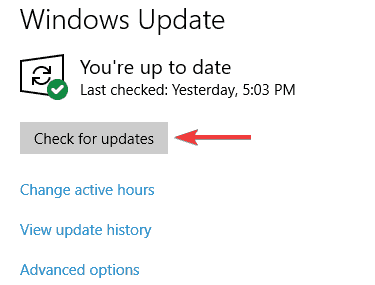 Once your PC restarts, the problem should be resolved and you’ll be able to use Cortana once again. If you don’t want to restart your device, you can try to log off and then log back into your account and check if that solves the issue. According to users, sometimes problems with Hey Cortana feature can appear due to your system. If your system is out of date, it’s possible that there are certain software bugs that can interfere with Cortana and prevent it from working properly. Now click Check for updates button. If any new updates are available, they will be downloaded in the background and installed as soon as your system restarts. Once your system is updated, check if the problem with Cortana is resolved. Open Control Panel and open Realtek HD Audio Manager. 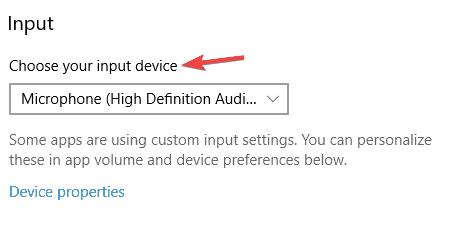 When Realtek HD Audio Manager opens, go to Device Advanced Settings. Now choose Separate all input jacks as independent input devices. 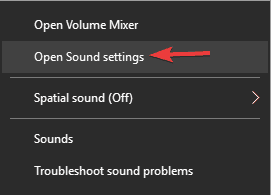 Right-click the Speaker icon in the bottom right and choose Open Sound settings. Locate the Input section and set your microphone as the default audio device. After doing that, make sure that you run the wizard and optimize Cortana for your voice. After doing that, the problem with Hey Cortana feature should be fixed. If Hey Cortana feature isn’t working on your PC, you might be able to solve the problem simply by turning it off and back on again. This is quite simple solution, but many users reported that this method worked for them, so be sure to try it out. Open Sound settings. We showed you how to do that in one of out previous solutions, so be sure to check it out. In the Input section click the Device properties. When Microphone Properties window opens, go to Levels section. 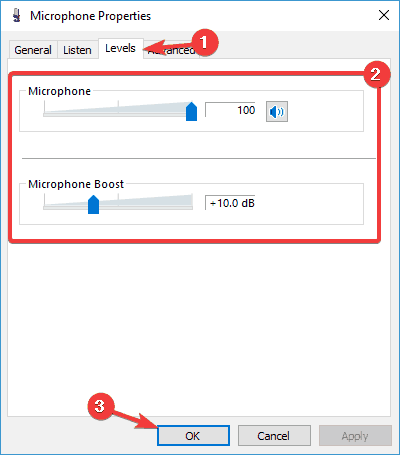 Adjust Microphone and Microphone Boost sliders. 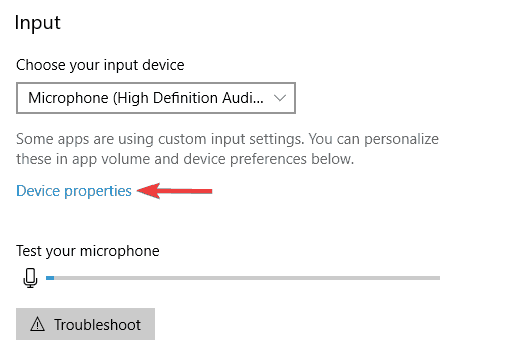 Now click Apply and OK.
After adjusting Microphone levels, your microphone will be more sensitive to sound and the issue with Cortana will be resolved. 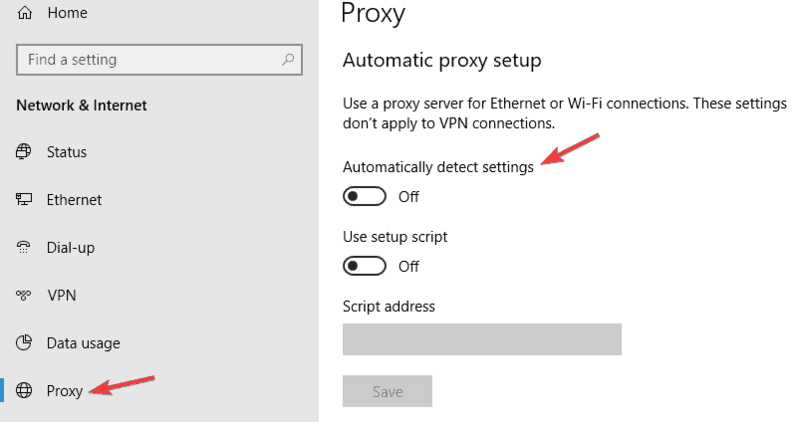 Many users tend to use proxy in order to protect their privacy online, but in some cases, your proxy can interfere with Cortana and cause problems with Hey Cortana feature. Open the Settings app and go to the Network & Internet. In the left pane, select Proxy from the menu. In the right pane, disable all options. Once the proxy is disabled, the problem should be resolved. If you’re concerned about your privacy online, we suggest considering switching to a VPN. There are many great VPN clients on the market, but if you’re looking for a good VPN client, we suggest that you try Cyberghost VPN. Sometimes Cortana’s data can be corrupted, and that can lead to issues with Hey Cortana feature. However, you can fix this problem by removing the corrupted data. 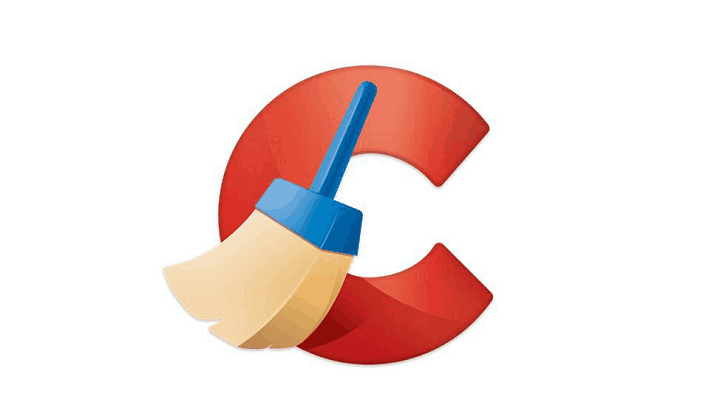 Doing this manually can be a tedious process, therefore it’s always better to use cleaner software such as CCleaner. Simply start CCleaner and go to Applications > Windows Store > Cortana. Now click the Clean button to remove these files. Once you remove these files with CCleaner, the issue should be resolved and you’ll be able to use Cortana without any problems. Choosing the right settings for your Virtual Assistant should solve your problems with Cortana not recognizing your voice. But in case you still have any problems with Cortana, even after you set everything right, tell us in the comments, and we’ll try to assist you further.